Two broken bones in his left ankle. It has been a rough season thus far to be on the MLS Dsciplinary Committee. Thus far in the league we’ve had several brutal tackles that resulted in snapped bones. However, this latest instance brings up a frustrating look at the difficulties of sending a message to the league. 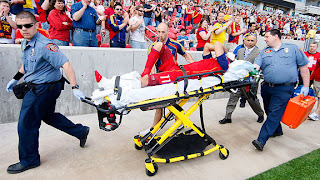 The disciplinary committee of MLS made their decision over both the lenth and the fine against Marcos Mondaini for his leg-breaking tackle on Javier Morales. Mondaini will serve a four game suspension and forfeit $1,500 dollars in fines. Now let us be clear, regardless of outcome, someone was going to come away with this unhappy. That said, MLS just sent a very distorted message to its players and the fans. After a bold statement in suspending Brian Mullan ten games and fining him $5000 dollars for his tackle on Steve Zakuani, this move will rub a lot of people the wrong way. Mondaini was reckless in his attempt to stop Javier Morales and while his tackle does not look terribly aggressive it certainly wasn’t justified or legal. The league is defending the shorter suspension by saying that in the case of Mondaini he was reckless or clumsy but not in no way trying to hurt Morales. Unfortunately, that doesn’t matter. Morales was hurt and will be hurt for months. Morales never took his hands off his face. While the replay is not at graphic as the break of Zakuani’s leg, you can clearly see the ankle of Javier Morales bent in a very unnatural way. Morales will be out for most of the season and its likely won’t return to form until 2012. MLS has stated time and again that it is working to protect the league’s attacking talents, so what kind of message does this four game suspension send to the league? A weak one. If players are to take the league seriously and stop the dangerous tackles, then the consequences for such an act should be systematic and clear, regardless of injury. Four games and a small fine for Mondaini but four months minimum of pain, rehab and struggle for Morales hardly seems fair. Something closer to seven or eight games would have been more appropriate. With that, the league could still have sent a message that it was serious about protecting players, while acknowledging the differences in Brian Mullan and Marcos Mondaini’s tackles. Unfortunately MLS dropped the ball on this one and it’s the Real Salt Lake fans, players and coaches who will be left to suffer most over it. 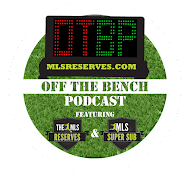 For those who missed it here are my Thoughts on Zakuani and Mullan.